If you’re planning a spring Prairie Dog adventure, it’s time to load up a big supply of ammo. On a 4-day varmint safari you can easily shoot 800 rounds or more in a prime P-Dog location. To save on ammo costs for high-volume shooting, it makes sense to buy components in bulk. Here’s a super deal on bullets for your .224-caliber varmint rig. For shorter-range ground squirrel loads, we also like the .224 34gr Flat Base Hollow Point at $44.25/500. These work great in a .221 Fireball (using Lapua .221 Fireball brass of course). Share the post "P-Dog Gone Good Deal on Varmint Bullets"
NOTE: Despite the “BLK” in the name, this is a NOT a black powder substitute. This is a modern smokeless powder suitable for a wide variety of popular cartridges. Hodgdon has announced a new “faster” variant of its popular CFE 223 powder. That’s good news for shooters of small varmint cartridges. Hodgdon’s new CFE BLK (named after the .300 AAC Blackout cartridge) has a faster burn rate than the original CFE 223. That makes CFE BLK ideal for small cartridges such as the .17 Hornet and .221 Fireball. The original CFE 223 propellant was formulated for reduced copper fouling (“CFE” in the name refers to “Copper Fouling Eraser”). New CFE BLK shares this reduced fouling technology which was developed originally for the U.S. military. Many of our Forum members have tried CFE 223 and confirmed that is performs “as advertised” — with less copper fouling that most other propellants. That’s a big benefit for varmint shooters, who may put hundreds of rounds through a barrel in a single day on the varmint fields. Optimized for the .300 AAC Blackout cartridge, CFE BLK works great for .300 Blackout loads in AR-type rifles throughout the range of bullet weights. Moreover, CFE BLK is perfect for subsonic, reduced loads. In addition, Hodgdon reports that CFE BLK performs superbly in many smaller-capacity cartridges, in particular varmint cartridges such as the .17 Hornet, .17 Ackley Hornet, .218 Bee, .221 Fireball. CFE BLK is also well-suited for the 6.8 Remington SPC and the 7.62X39 Russian cartridge. Starting in January, 2017, CFE BLK powder will be available in both one-pound (1-lb.) and eight-pound (8-lb.) containers. Check with leading vendors such as Bruno’s, Midsouth, and Powder Valley. By the end of 2016, you should find complete load data for CFE BLK on the Hodgdon Reloading Data Center at www.HodgdonReloading.com. Share the post "New Hodgdon CFE BLK Powder — Great for Small Cartridges"
With over 1600 exhibitors, there are tens of thousands of products on display at the 2014 SHOT Show. Here are some products that caught our eye as we walked the aisles of the Sands Expo Center. This is an engraved action (with gold inlays), the centerpiece of a presentation-grade Sharps rifle from Davide Pedersoli of Italy. It’s nice to see old-world craftsmanship applied to a classic American design. 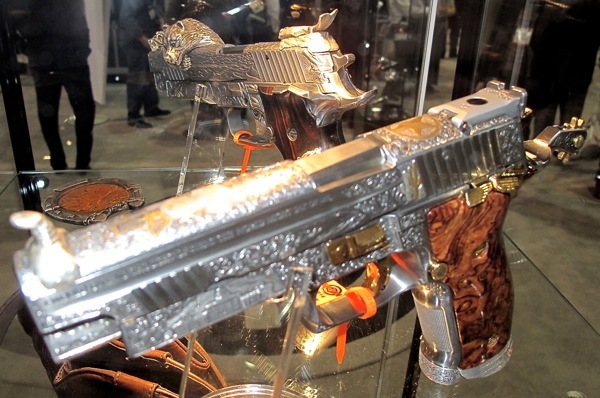 Here are two completely over-the-top, highly customized SIG pistols. 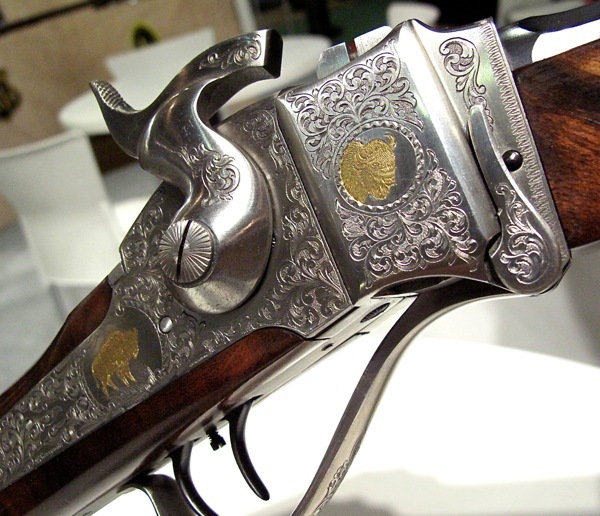 On the cowboy-themed pistol on the foreground, a saddle horn serves as the front sight, and the beavertail features a gold-plated spur that actually spins. The SIG in the rear has an elaborate metal carving of a bear that wraps over the top of the slide. The carved tail of a salmon forms the rear sight. The only new smokeless propellant displayed at the Hodgdon booth was CFE Pistol. Like the original CFE 223 powder for rifle cartridges, CFE Pistol is formulated to deliver reduced copper fouling. 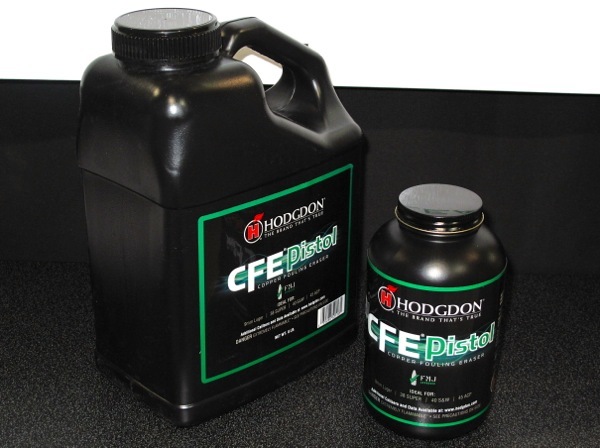 Hodgdon says: “Shoot More, Clean Less” with CFE Pistol powder. 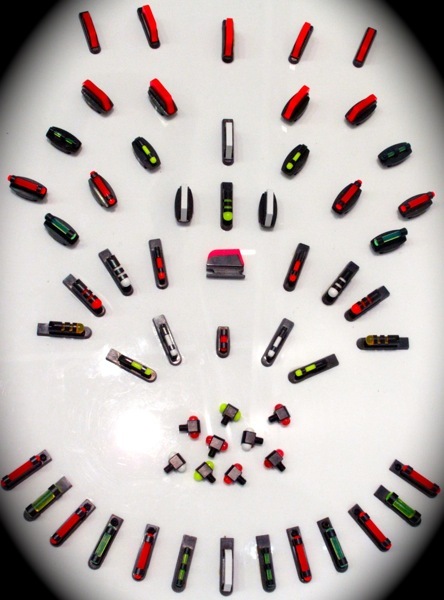 Here is a display of hi-viz and fiber-optic front sights from German gun parts-maker Recknagel. Someone spent a lot of time putting this display together in such an artistic way. Digital read-out on Schmidt & Bender 3-27x56mm PM II will display info from ballistic computers, laser rangefinders, or wind measurement devices. This is an early prototype only — not “ready for prime time”. The digital info is all generated “off-scope”. 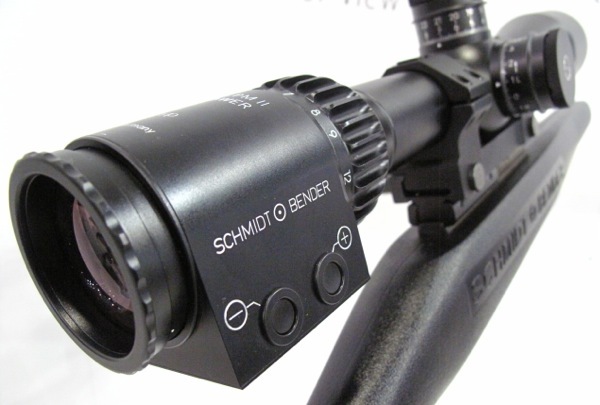 The fixture on the eyepiece end of the S&B scope merely receives info from the external device(s) and displays it in the shooter’s viewing field. 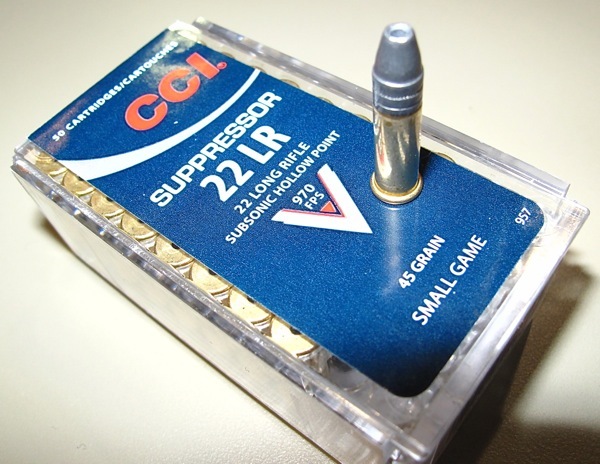 CCI will offer a new “Suppressor 22″ cartridge for 2014. CCI selected a fairly heavy, 45-grain bullet, and tweaked the propellant to ensure that all rounds out of the box will run sub-sonic, even with the expected mass-production velocity variations. Designed for use in suppressed rimfire rifles, Spec Velocity is 970 FPS. CCI claims that this ammo works well on small varmints because the large hollowpoint in the 45-grain bullet provides excellent bullet expansion. This Pelican IM2306 is specifically designed to carry high-end riflescopes. 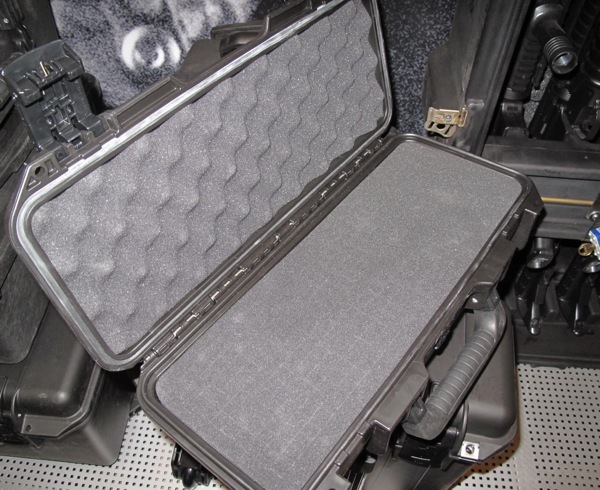 Measuring 18.2″ L x 8.4″ W x 6.7″ high (on the outside), this Pelican case has a waterproof seal and rugged exterior. “Pluckable” interior foam allows you to custom fit the case to your precious optic. Share the post "Snapshots from SHOT Show 2014 — Eye-Catching Products"
Hodgdon Powder has introduced a new spherical (ball) powder called CFE™223. Hodgdon claims that this new powder “greatly deters copper fouling” compared to other propellants. Originally developed for U.S. rapid-fire military systems, CFE™223 incorporates a proprietary chemistry named “Copper Fouling Eraser”. Based on tests with extended shot strings, Hodgdon claims that, by using CFE™223, match shooters, varmint hunters, and AR shooters can maintain accuracy for longer periods, with less barrel-cleaning time. Reload data for CFE™223 is available for 27 different cartridges with 147 loads. It is suitable for loading in many popular chamberings including: .204 Ruger, .223 Rem, 22-250, 6mmBR, .243 Win, 6.5 Creedmoor, .260 Rem, 7mm-08, and .308 Win. Maximum velocities are obtained in the .204 Ruger, .223 Rem, 22-250, and .308 Win with load data found at Hodgdon’s Reloading Data Center. CFE™223 is a spherical (ball) powder, so it meters well. The new powder will be available in one- and eight-pound containers starting in January, 2012. For more info, call (913) 362-9455 or write to: Hodgdon Powder, 6231 Robinson, Shawnee Mission, KS 66202. Share the post "Hodgdon Claims New CFE™223 Ball Powder Deters Copper Fouling"